Description: This sophisticated fit-and-flare wedding dress features cascades of beaded lace motifs and Swarovski crystals over tulle. 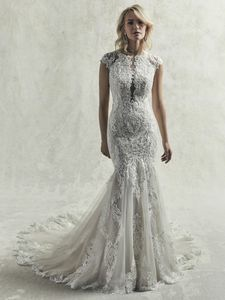 The unique jewel neckline features an illusion plunge, while chic lace motifs complete the illusion cap-sleeves, illusion plunging back and voluminous train. Finished with crystal buttons over zipper closure.